« Happy New Year for 2014! I’ve seen unusually large CAD .dwg files. I had the same problem when a colleague stumbled onto a solution that greatly helped me. Open the drawing….wblock, click on “Entire Drawing” and save it. I had a simple file that was 73mb and by doing this it reduced it down to 3mb. And quickly , too. The WBLOCK command writes (saves) the objects in a drawing as a new drawing. You can specify specific objects or the entire drawing. A bonus is that you lose many settings in the current drawing. 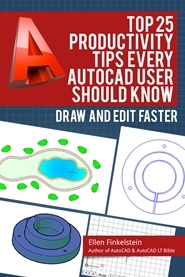 You can therefore use this technique to troubleshoot problem drawings that don’t behave the way you want them to. It’s often hard to ferret out the settings that might be causing the problem — such as system variables — so moving the objects to a new drawing can be an easy fix. If you want, you can select objects in advance. Type wblock on the command line or choose Insert> Block Definition panel> click the Create Block drop-down arrow and choose Write Block. (It’s easiest to just type it on the command line.) The Write Block dialog box opens. If you pre-selected objects, the number of objects appears in the Objects section of the dialog box. To write the entire drawing, choose Entire Drawing at the top. You can choose a base point. If you want to be able to insert the drawing (or the selected objects) using a base point on one of the objects, for example, click the Pick Point button and specify the base point. In the Objects section, you can choose to retain the objects in the current drawing, convert them to a block, or delete them from the drawing. In the Dstination section, click the Ellipsis button and browse to the location where you want to save the new drawing. Give the drawing a name and click the Save button. If desired, choose units from the Insert Units drop-down list. You can choose Unitless. You can even choose light years or parsecs if you’re thinking really big! If you did these steps to make your drawing smaller, go into Windows Explorer and check the size of the original and new drawings. 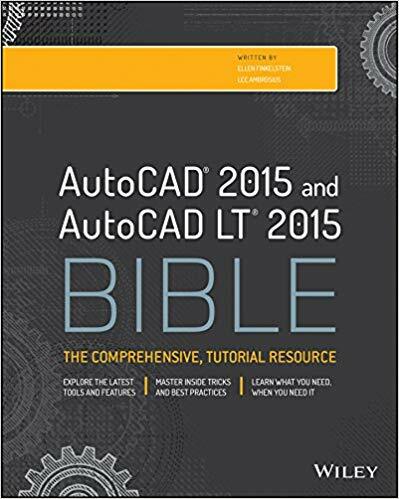 What techniques have you used to reduce the size of AutoCAD drawings? Leave a comment! why the object are shrank and when plot is not expanding the object are to small i plot it on A0 the object still small i tried also to scale but i cannot get the exact scale. Things to keep in mind when saving drawings with unexplanable size is to keep an eye on the block index and possebly the sometimes unseen content in the layout tabs. Purge and autit are essential commands, and don’t forget to select “purge zero length and empty objects” to get those as well. And another small but sometimes speed increasing setting is under the “saveas” window, select tools, dwg options, and in the drop down menu “layer and spatial”. That one might not be the most speed saving for the basic drawing itself, but it does help when it’s used as a (clipped) xref. Dirk thanks for the tip on the “Layer & Spatial” I didn’t even know it existed. My company sometimes gets “clip happy” and often causes many errors in doing so. This may assist with that. PS. Is there a system variable for this? lost the ability to see dimensions as drawing.. in Autocad. drawing a rectangle or edit it the dimens would show and you can tab to what you want to change and set it… that is gone and can not find how to get it back. Kevin, I want to pass this on, but don’t understand the question. Can you rephrase it? I think i might have found the problem KevinS is referring to, it might be the “Dynamic Input” button that can be toggled with the F12 key. That one modifies the behaviour of the input when you draw lines or other objects. I wanted to add that sometimes there are certain objects in a dwg file that can’t be purged, wblocked, etc. If you have a situation where your drawings is more than a few meg in size … it really should be much smaller, even in today’s CAD. So try this! First turn on and thaw, and unlock all the entities that you want to keep. Next type COPYBASE, use 0,0 and manually select all the entities that you can see with WindowPolygon or WindowCrossing selections. The trick here is not to use ALL or SELECT ALL selection methods because we are trying to only select visible and real objects! Next, open another instance of AutoCAD, and in Drawing1.dwg type paste. Next type SAVEAS and then compare the two drawing files. Many times, I have seen a 12 meg drawing in Civil3D go to 0.5 meg. And remember that a smaller drawing is more efficient, faster, and easier to email… so don’t knock yourself out trying to send a 12 meg dwg by email when it’s not necessary! The downside is that you loose all your settings (an you should have a way to put them all back). The upside is that you may have reduced your file size by as much as 10X. And since this trick relies on the QNEW setting, make sure that drawing is not bloated as well, because you will never get the file size smaller than your QNEW drawing. it worked on my dwgs,i follow the above 8 steps but i selected the entire drawing. really its amazing for me.my actual file size is 103.067kb(100MB) is changed to 7.58MB. Usine Acad LT 2013… I have wBlocked a 12 meg dwg. now it is like 1.7 meg. The problem is the file is now saved as the version of Acad LT I am using. The customer wants the file saved down as 2000. After wBlock,opening that file and saving as an older Acad version the file is back to 12 meg. Anyone have an answer to why this is happening. I have tried the above “WBLOCK” command, but the file size increased by 1MB from 48MB instead of reducing it. Please tell me if there are any alternate commands. MANY MANY THANKS. IT’S VERY UASEFULL. 1.) Put all architecture on a single layer, isolate, then join (multiple times) all the lines to polylines to reduce number of objects. This greatly reduces size. 2.) type NU (qselect), select all points and delete. 3.) type NU (qselect), select lines <= 10mm in length, and delete all. You can even try <= if you need to. Repeat this step with polylines. 4.) type B (block definition), search for any blocks that only appear once, burst/explode them and join all lines. For any other blocks that appear multiple times, edit them and join all the internal lines. 5.) NEVER use overkill, except for removing duplicated blocks. Mostly it increases the amount of objects, unless you have a REALLY inefficient drawing. 6.) use LSPs such as strip mtext, attribute definition to text etc. to clean text and set all to STANDARD , Arial, Text Size 0. 8.) 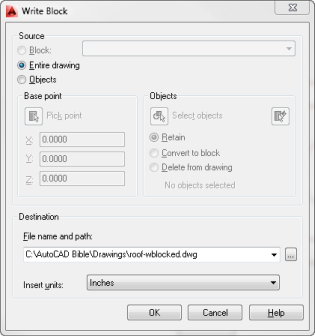 use -EXPORTTOAUTOCAD to convert all objects to ACAD types. 9.B) you can make a button that does “^C^C-purge;a;*;n;-purge;r;*;n;audit;y;” to run purge,-purge and audit with a single click. wblock worked and saved my day… thanks man. I want to delete unwanted data from file….I am trying to make wblock to reduce size & clean the file. Txns, it works perfectly in my drawings. I use WBlock pretty regularly because it gets rid of all of the unwanted linetypes in a drawing. I find this helpful when drawings have been reused. However, it will get rid of layer states. Also, today I used it and my 0,0,0 shifted and I had to go into my xref’ed drawings to realign it with the content.